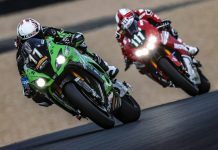 For motorcycle road-racing fans, February has two Valentine’s Day – the official one, and the opening round of World Superbike. And nothing gets the heart pounding more for the latter than some onboard video feed of a lap around the 2013 World SBK’s season opening circuit, Phillip Island. A day before the Phillip Island round begins, Pata Honda released the above video of Jonathan Rea piloting his CBR1000RR around the 2.761-mile Australian circuit. During the POV onboard lap, which was filmed during unofficial private WSBK testing last week, the 26-year-old Norther Irishman offers commentary, from gear changes to winds out of the Bass Strait affecting the riders. Rea would finish those unofficial testing sessions third fastest, two-tenths of a second behind the leader, FIXI Crescent Suzuki’s Leon Camier. During Monday and Tuesday’s official test sessions at Phillip Island, Rea would finish sixth fastest overall behind the leader, Alstare Ducati’s Carlos Checa. For a preview of 2013 World Superbike at Phillip Island, click here.